You have a life … – So code in blocks! With TUNIOT … Internet of Things world is easy! TUNIOT is a code generator for the ESP8266\ESP32 boards. You don’t need any coding skills to program it and make your IoT project. The tool is available on 7 languages and in active development and documentation is available! There is several resources in different language to learn ESP8266\ESP32 and program in blocks mode. TUNIOT FOR ESP8266: This is a visual programming tool for the ESP8266 based boards like NODEMCU, Wemos, Huzzah … I think that board is enough mature to be used. There is a big community behind with a lot of projects and forum discussion. You will find more about the tool and the documentation on this page. 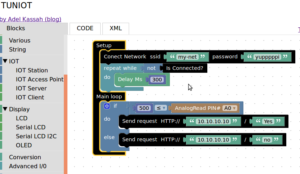 TUNIOT FOR ESP32: This is a visual programming tool for the ESP32 board. 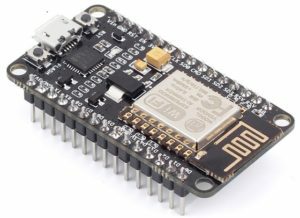 The ESP32 is a quite new board and the libraries under the arduino IDE are still in active development. You already can start learn and programming with blocs and do basic things. 3- IOT Workshop for the association “Jeunes Science” in Djerba. 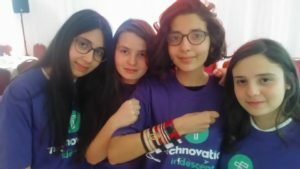 My team (4 girls aged 14 and 15 years old) participated in the Technovation challenge with a wearable device and an Android App. The girls are 14 and 15 years old. In the project, a heart beat sensor connected to an ESP8266 stores data in the cloud while another Android App will receive these information and alert the family and doctor with the status of an old person. It also offers services of geolocation. 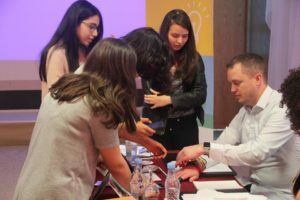 One of the goals of the participation is to break the barrier between hardware and software since a young age and make the students able to master new trends in Technology in a quick and creative way. “A journey of a thousand miles begins with a single step” and this step is a BIG one!